Volunteers and sponsors are always needed for sports, events, programs or social activities. For more information on how you can help, please contact Sarah Stern or Nicole Herrera. Click here for the 2019 Brochure Page! Need help registering online? Click here for our step-by-step guide! What is Therapeutic Recreation & Unified Sports? Therapeutic Recreation is the practice of using purposeful recreation and leisure to address the specific needs and goals of everyone in our community, no matter the ability. We believe that every person should be able to participate in recreation activities with no issues, barriers, or hindrances. Our programs take a holistic, inclusive approach that provides a positive environment for every participant to learn a new skill or sport, be more active, develop social skills, and have fun! Unified Sports are inclusive sports programs that combine an approximately equal number of Special Olympics athletes (individuals with intellectual disabilities) and partners (individuals without intellectual disabilities) on teams for training and competition. Smaller fields and modified equipment may be used to ensure fairness and safety for all. Mark your calendars with this year's programs that interest you! You can find more details on each sport/program/event seasonally below. Check out our APRIL Program & Event Calendar! CONGRATULATIONS to our Charleston Swamp Foxes Unified Basketball Team who won GOLD at the Special Olympics State Basketball Competition! Actors: Join us to perform a mystery dinner show and find out the biggest question of all...WHO DID IT?! 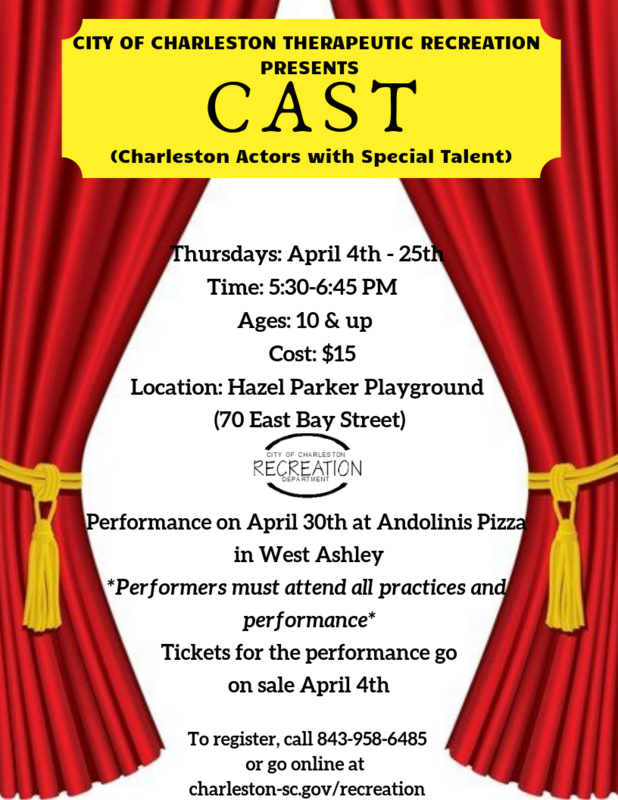 This program is offered in partnership with the College of Charleston Theater department. Registration: Pre-registration is required. Deadline to register for this program is March 21st. Tickets for the performance will be available on April 4th, 2019. For more information, please call 843-958-6485. Inclusive dance class for dancers of any ability. Come explore various dance styles (including hip-hop, contemporary, improvisation, and more) in a creative, accepting, and fun environment! Presented by DanceFX and FEELanthropi Integrative Arts. Registration: Pre-registration is required, as space is limited. 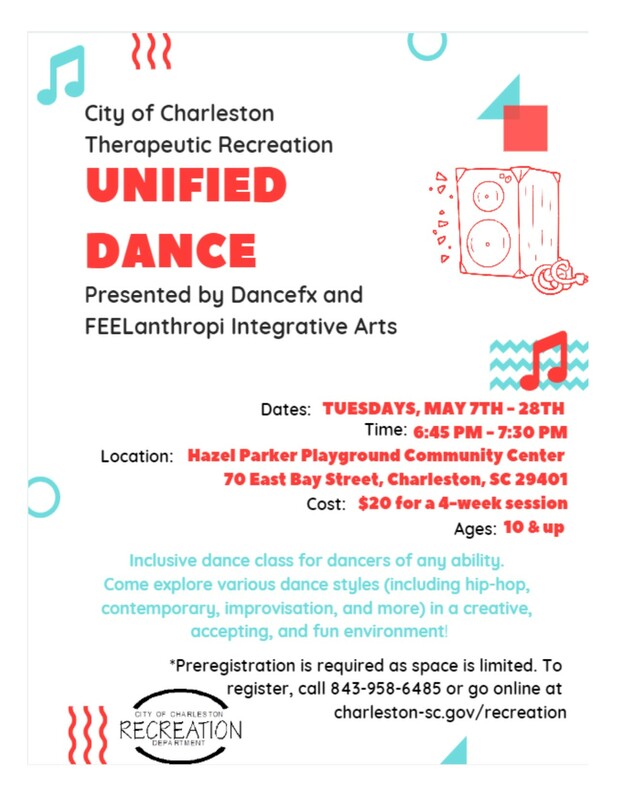 Register online at http://rectrac.charleston-sc.gov.